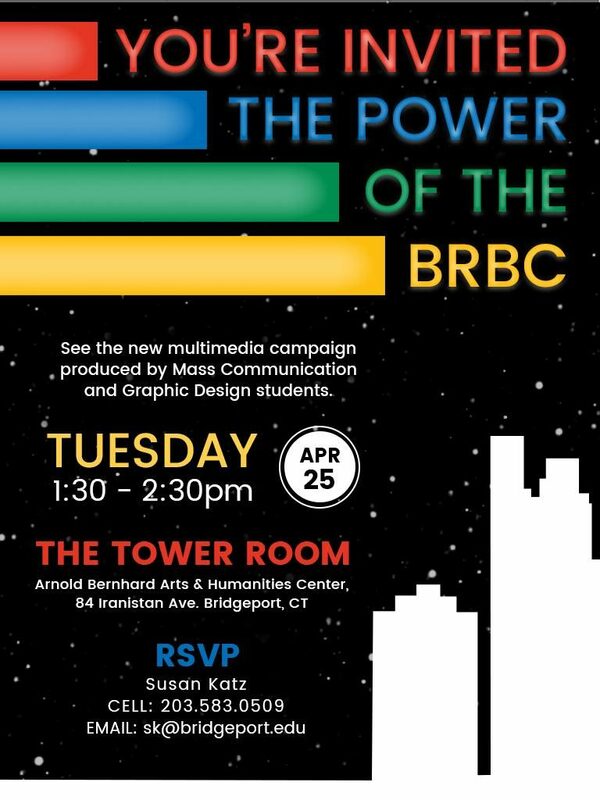 Tue 25 Apr 2017 — Professor Susan Katz’s PR & Advertising class will present their campaign for the Bridgeport Regional Business Council to the BRBC Tuesday 25 April 2017 in the Arnold Bernhard Center’s DuPont Tower Room. The course joins SASD Graphic Design students with Mass Communications students to produce a yearly campaign for real-world clients. Please join us as we unveil our student-produced multimedia marketing campaign, The Power of the BRBC. The Bridgeport Regional Business Council (BRBC), the region’s premiere business organization, is over 800-members strong. Join Mass Communication and Graphic Design students for the presentation launch. BRBC CEO Mickey Herbert, BRBC Communications Director Jocelyn Paoletta and other board members will be there. UB is a member of the BRBC. Refreshments will be served. Feel free to bring your classes. Kindly RSVP.